What have I got on hand? What would look pretty together? What would taste good together? 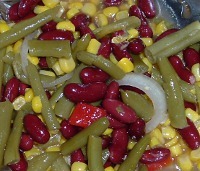 So I opened cans of corn, green beans, and kidney beans, sliced an onion, and diced a roasted red pepper (from a jar). I mixed two parts rice vinegar to one part sesame oil and added a teaspoon of sugar and a dash of Mrs. Dash Garlic and Herbs. It tasted as good as it looks, and it isn’t just me who says it: precious little of it came home from Easter. Mission accomplished. A WRITING PROMPT FOR YOU: A character takes food to a pitch-in dinner and only one bite is eaten. Why? Have you ever cooked anything and thought, “That red cabbage will look pretty with all the other colors,” and it turned out EVERYTHING turned red?